No matter how many days our visit to Manila may be, we always fly back feeling that it was too short! As they say, time flies when you're having fun and our recent 5 day trip zoomed by so fast that I couldn't believed it when it was time to us to say goodbye to Manila once again. I have to say that among all the other visits that we've had so fast, this was the BEST. Why? Well, it's simple because we were able to see the people whom we wanted to see. Just our closest and dearest friends and family. Take for example my friends B and K, it has been a year since I last saw them and I really made it a point that no matter what happen, our planned lunch should push through. After all, the next time I'll see them, B will be a mommy while K will be a blushing bride. Oh, I'm so excited for them! Since I told them that I was to try a new restaurant this visit, we decided to check out Roots Market Bistro located at the new Greenhills Promenade. Outside, they're selling a couple of items such as herbs, organic items, nuts and more. I was easily able to get a table as the lunch crowd were almost done eating. B and K arrived shortly and we quickly proceeded to order. The menu was quite simple with a couple of options per category. 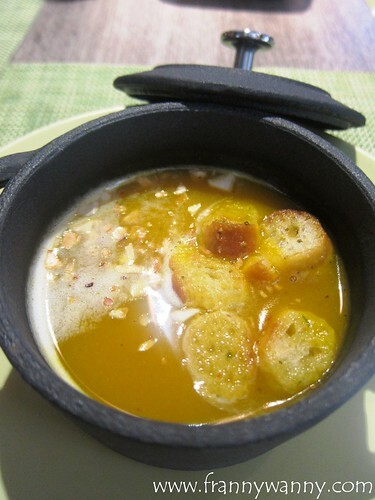 We started our meal with a bowl of Pumpkin Soup with Jalapeno Cream (Php. 116) each. I love how it came in a pretty French looking iron pot. The soup was creamy and very flavorful. I enjoyed every spoonful down to the last drop. To go with the pasta, we tried the Grilled Salmon (Php. 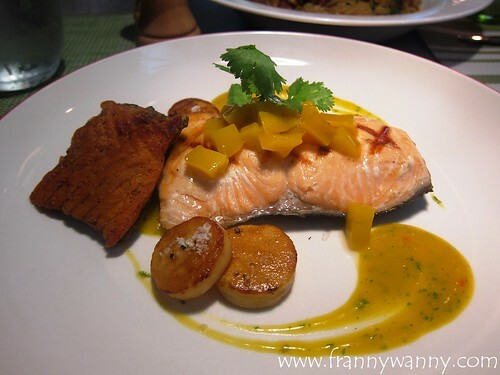 460) which was a thick slice of salmon with a piece of crunchy salmon skin, deep-fried potato confit and drizzled with mango cilantro relish. How silly of me to think that the potato confit were pan-seared scallops. So imagine my slight disappointment when I took a bite of it. In my mind it just went: "Oh." The salmon was well cooked and it was quite good too. I'd say it went pretty well with our pasta. 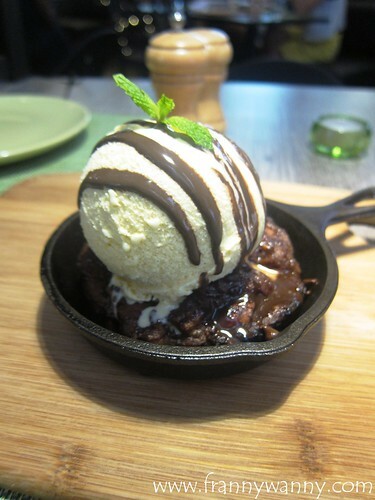 Lastly, we had the Chocolate Hazelnut Pudding (Php. 250) which sadly was a disappointment. I wasn't quite sure why it was sticky and the chocolate flavor wasn't quite there yet. I'm definitely avoiding this next time. 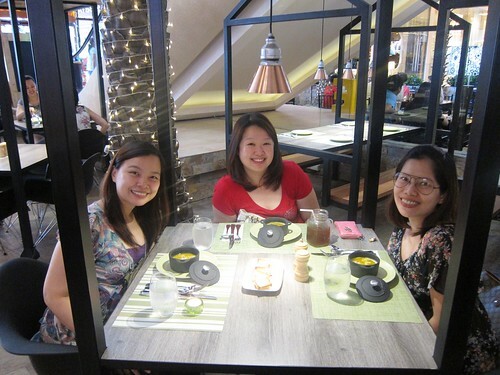 Over-all, what made my meal at Roots Market Bistro fun was because of my two companions who makes the best company ever. Food-wise, I'm going back for the soup but might consider checking the menu and trying other options for the rest. 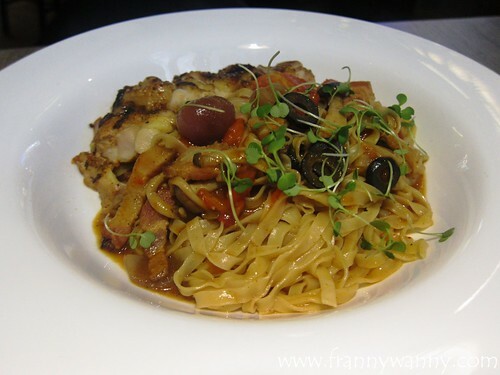 Roots Market Bistro is located at the Ground Floor, Greenhills Promenade, Greenhills Shopping Center, San Juan City.